The interim boss won’t name his starting line-up until he absolutely has to. 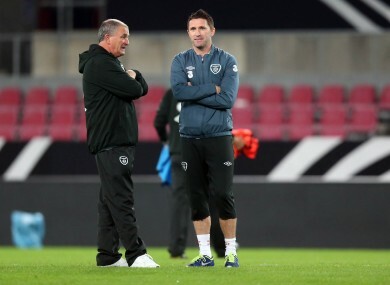 INTERIM IRELAND MANAGER Noel King will give Robbie Keane every chance to prove his fitness for tomorrow’s World Cup qualifying encounter away to Germany. An ankle knock prevented the captain training in Cologne today and King will wait to see how Ireland’s record goalscorer feels in the morning before making a definite decision on his fitness. “Still has a chance,” King said of Keane at this evening’s press conference,”it’s really a medical question at the minute, it’s best to leave him off and see how he goes tomorrow morning. King’s decision to avoid naming his starting 11 until it was necessary is contrary to the methods employed by his predecessor Giovanni Trapattoni. The Italian would bullishly announce his starting line-up sometimes 24 to 30 hours before kick-off, but King was equally forthright in his insistence on avoiding the team-sheet. “I have a fair idea [of the starting XI],” says King. “I probably have about 10 right, I’m just working with one in my own mind. And then with Robbie’s situation, we have to see how to handle that as well. He added: “Robbie’s been one of our leading lights over the years, he’s one of the leading scorers in Europe. If he doesn’t make it nobody will be happy, that’s for sure, but you get on with it. Should Keane’s ankle fail to improve King says he will pick from Kevin Doyle, Shane Long or Jonathan Walters, but remained tight-lipped on his plans for the formation as well as the personnel. “I’m not going to get hung up on formations. it’s about players and the area they play in. You’re very often dictated to by the opposition, which will probably be the case tomorrow. Email “Keane remains the major doubt as King holds off on team announcement”. Feedback on “Keane remains the major doubt as King holds off on team announcement”.